Last week I had the amazing honor of meeting Martha. Yes, the one and only Martha – Martha Stewart. I attended her show, met her briefly (fortunately long enough for a photo) then had meetings in her offices and got the grand tour. I must say, for someone who admires and respects Martha, it was a wonderful business trip! No, she isn’t the type of person who will come up to you and give you a hug, but heck, would you expect that from Martha?! But what you can expect was that she had the answer to every audience question after the show, from waffle recipes to compost piles. I was in awe. Her offices are nothing to sneeze at either – they take up a full NYC block and include everything from a craft room to an accessory closet to the infamous “test kitchen,” which you could smell down the hallway. After my meeting, the execs were nice enough to give me a Martha tote with her latest craft book (which went to my much more talented mother) and her latest cookbook, which I read cover to cover the minute I got home. It is called Martha Stewart’s Dinners at Home, and I would recommend it for any home cook. What I love about the book isn’t just the amazing recipes and beautiful photos, but she organizes the book by season, which is exactly how I love to cook. When I flipped to the page with the Curried Vegetable Pot Pie recipe, my husband declared he would love to have it on a Friday (since it is Lent, so he wouldn’t be eating meat). 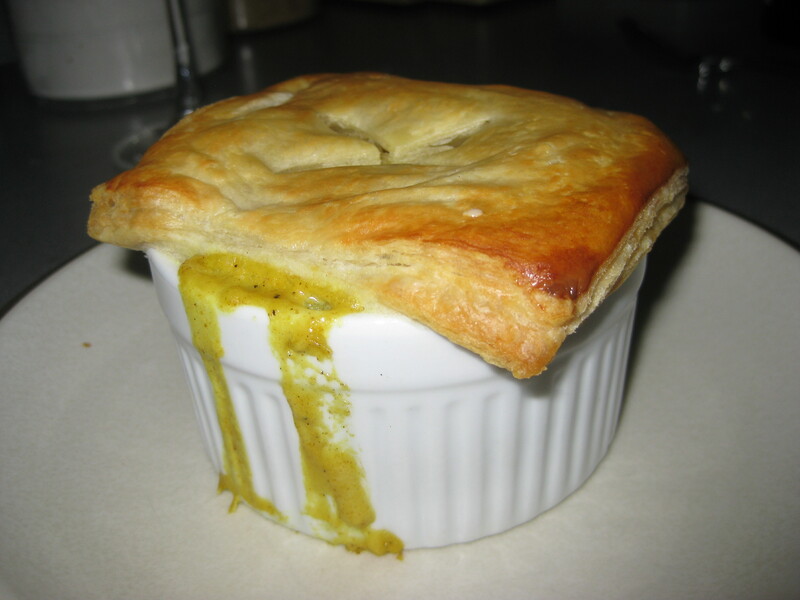 I will admit, I had never made pot pies before, and was a bit intimidated. But, Martha makes it sound so doable, so I figured I would give it a whirl. Only one bite in, both Rob and I declared it “blogworthy,” and halfway through gave it even more praise. The curry truly makes the dish – you could easily put in chicken if you wanted, but I certainly didn’t miss it. So, for all you vegetarians (and even meat eaters), this one is a winner. On a cold winter night, it is the perfect comfort food. Thanks, Martha, for this recipe! I hope our paths cross again! Preheat oven to 400 degrees. Cut pastry dough into four squares just larger than the ramekins (I recommend cutting them as a square around the inverted ramekin so you make the right size). Make several slits in the dough for steam vents. Chill squares on baking sheet until firm, 15 to 30 minutes (while you make the rest of the dish). Meanwhile, melt butter in a 4-quart saucepan over medium-high heat. Cook leek, parsnips and carrots with 1 teaspoon salt, stirring frequently, until slightly soft, about 3 to 5 minutes. Add flour, cook, stirring, until golden, 1 to 2 minutes. Whisking constantly, stir in milk, potato, and curry powder. Bring to a boil, reduce heat, and simmer very gently until potato is tender, stirring occasionally, 8 to 10 minutes. Season with salt and pepper. Divide cooked vegetable mixture evenly among baking dishes. Stir 1/4 peas into each dish, then top with a square of puff pastry. Brush pastry lightly with milk. Place on a baking sheet and bake until crust is golden and filling is bubbling, 22 to 25 minutes. Let cool 10 minutes before serving.